I have now spent quite a bit of time exploring scripting capabilities and found it really interesting. I only wish I had been fully aware of their capabilities some time ago as scripting really can help with the small daily customising tasks. However, although much easier and quicker than writing AddIns they can be frustrating to debug! Having done that, it was time to review where I should focus my energies next. I started by reviewing the hot topics (and posted my observations) and look at a set of my mindmaps in which I dump my thoughts. From this I have extracted a subset of topics, following on from my last candidate list – this is the diagram below which you can click to get a larger version. And with that done I’ll carry on and do some more posts to report on progress. Just having a look back at my somewhat random series of experiments over the last few months and thinking about the areas of EA that I don’t understand fully. In fact there more I find out and think about what EA offers the more I see there is so much more to check out. Perhaps that’s inevitable with any broad ranging product and, of course, Sparx are adding more all the time. 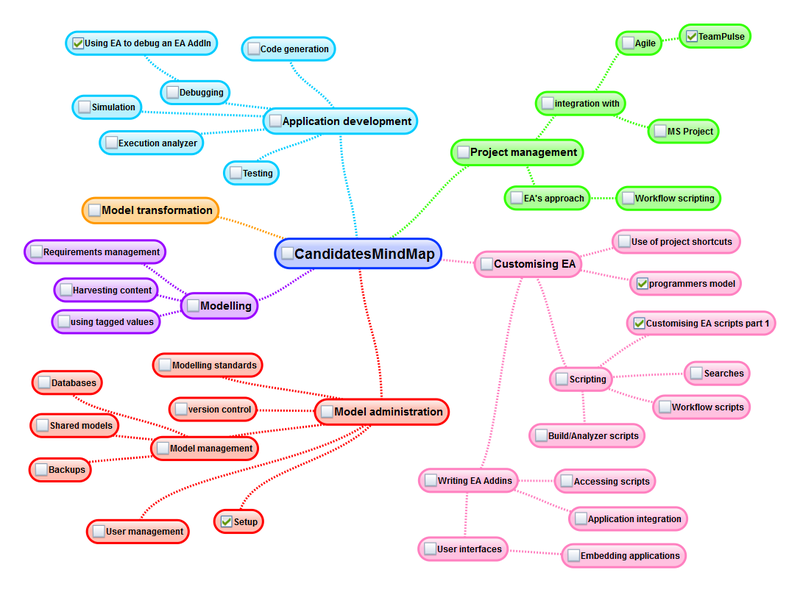 The mindmap below gives some idea of the topics of interest to me, in particular the areas of application development and customising EA, in particular those aspects that enable me to use EA as my central tools and interacting with others as and when needed. This mindmap is not complete – otherwise it would be unreadable!! So starting to go into a few new areas. More to do on the above in the next few weeks and will post as information arises. I occasionally look at this page and realise that what I wrote months ago hasn’t changed much, but I’ve being doing bits and pieces when other work permits. I’ve worked with Full End 2 End development of simple applications – and so far not convinced it’s scaleable. I feel that this shouldn’t be the case and feel I should persevere. I think the problem I have faced is working in 2 tools VS and EA, and concerns with sync between the two. I can see that if I write, compile and build from within EA then it should be fine, however EA doesn’t have the richness of development aids provided by VS. I suppose if I were working with systems which did not provide a windows GUI (e.g. some embedded systems) it would be fine. However, … I probably need to explore this further. I’ve done some AddIn work both within EA and MS Project to provide developers and project managers, respectively, with RW access into the EA repositories/Project files. However, what I haven’t done is write too much about them! Full End 2 End development of code – I have used EA to do part of my developments but want to check out how to work from a concept to producing and testing code and produce some real examples; guess a lot to learn here – so could be a long time doing this, possibly the never ending task! As above – found some limitations which for my daily work make it a show stopper – but can see that there are probably areas where it really would be useful. Requirements management – the reason I got into using EA in the first place; the idea that I could put some structure and order into product development. In my mind requirements management cannot stay as a list in a spreadsheet it needs to be managed within the context of the product that is being developed and to which it can be linked – it is part of the design process.